When I get a little pang of nostalgia for Spain, I love taking out the pictures and revisiting those fond memories. My other favorite thing to do is reliving those moments through cooking. Food is one of those things that is just so intertwined with memories – childhood, first dates, birthdays, that one night. How many times have you ever had a tasty bowl of beef stew or sinigang that undeniably reminded you of home at first bite? It has to be just right – not one more pinch of salt, not one less dash of pepper. Suddenly it’s like you’re 8 again, in mom’s kitchen, sitting at the table and your feet can’t quite reach the floor yet. Even for a few minutes, you can be swept back in time. Although I haven’t even come close to re-creating the mouth-watering perfection of Antonita’s* dishes (yet), it hasn’t stopped me from trying! 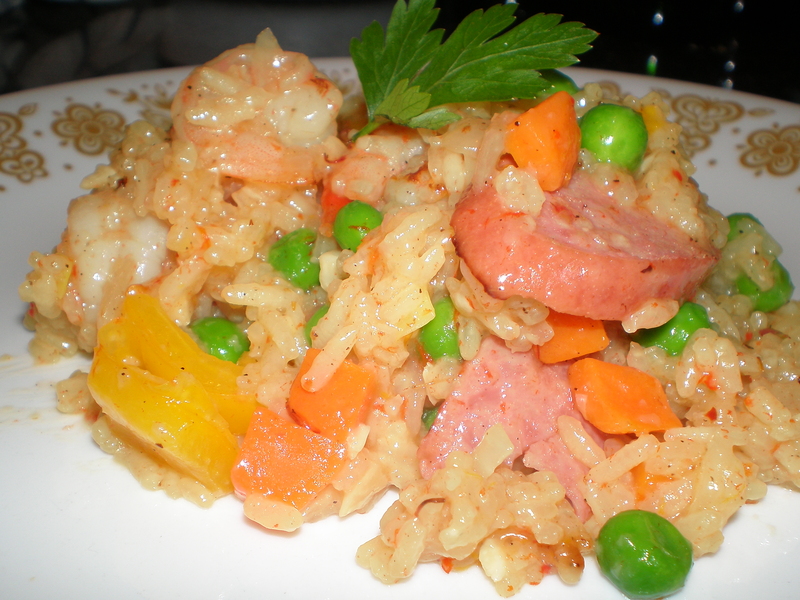 I found this interesting take on Paella from Ina Garten. She is one of my faaavorite Food Network chefs, known for using fresh ingredients, many from her gorgeous garden (I want!). Her method differs from the traditional way of cooking Paella, but the end result was incredibly tasty, so no complaints here! Step 1. Core both peppers and cut into strips. 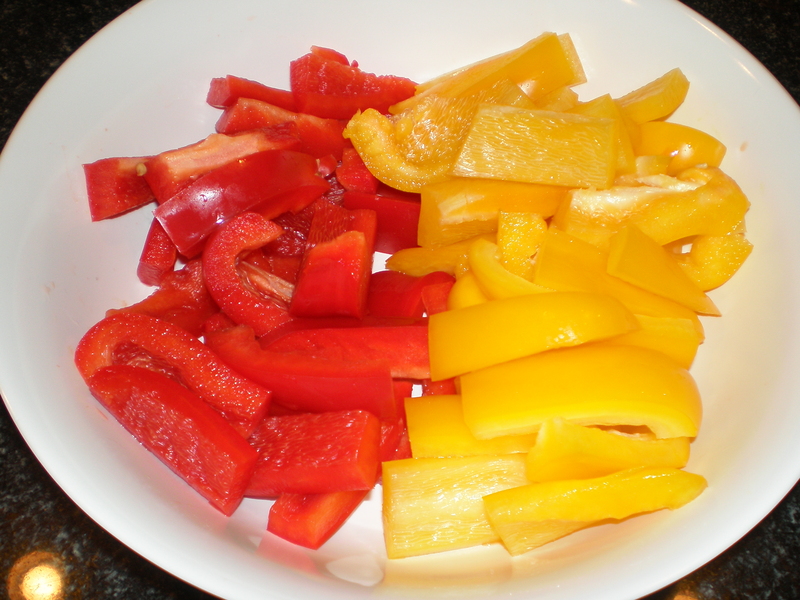 Red, green, yellow or orange, use any color pepper you’d like. I find the red and yellow to be a bit sweeter than the green. Step 2. 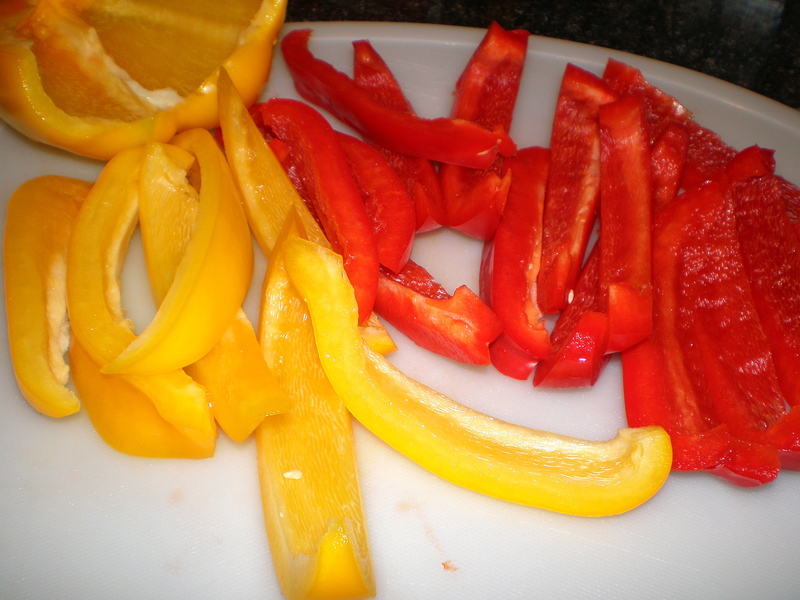 Slice pepper strips in half then set aside. Step 3. 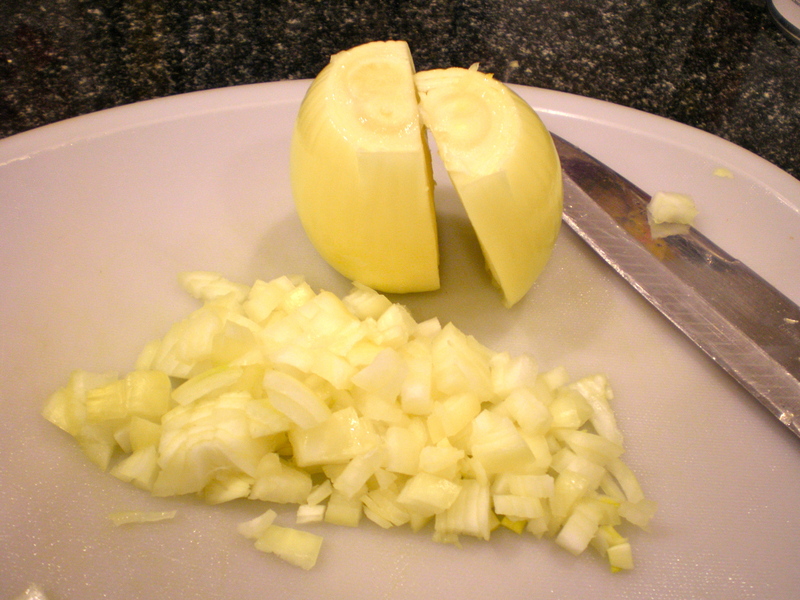 Dice two medium-sized yellow onions. 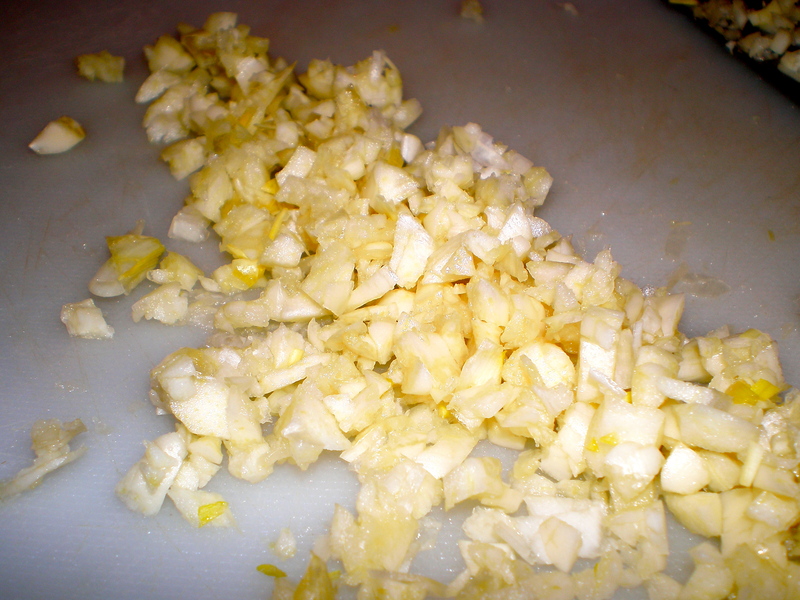 If you’re a cry baby when it comes to chopping onions, squeeze a bit of lemon juice on top of the onions. Trust me, it works. Step 4. Mince the garlic cloves. Step 5. 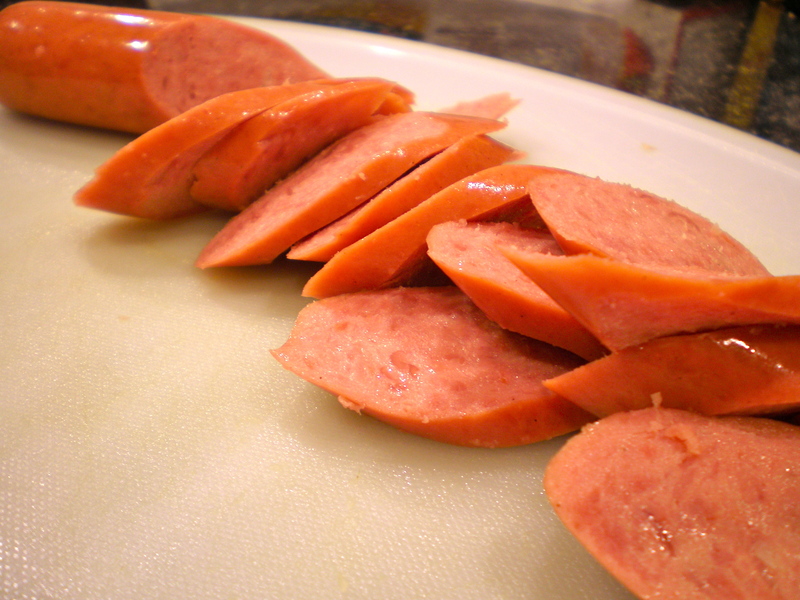 Slice the Keilbasa into thin (1/2 – 1/4 inch) cuts, diagonal. Set aside. Shell the shrimp and set aside. Step 6. In a deep pot, turn the heat to medium and pour enough olive oil to coat the surface (about 1/4 cup). 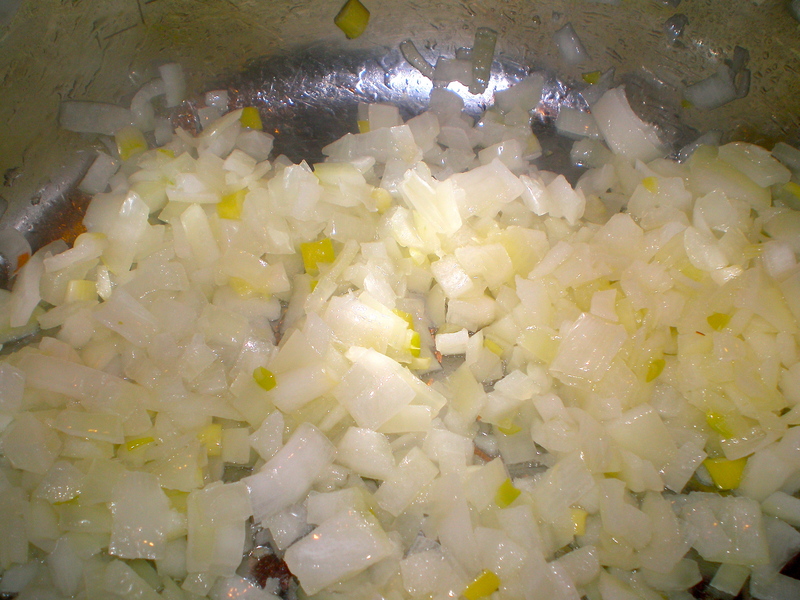 When hot, slide in the onions and allow them to sweat, about 5 minutes. Step 7. 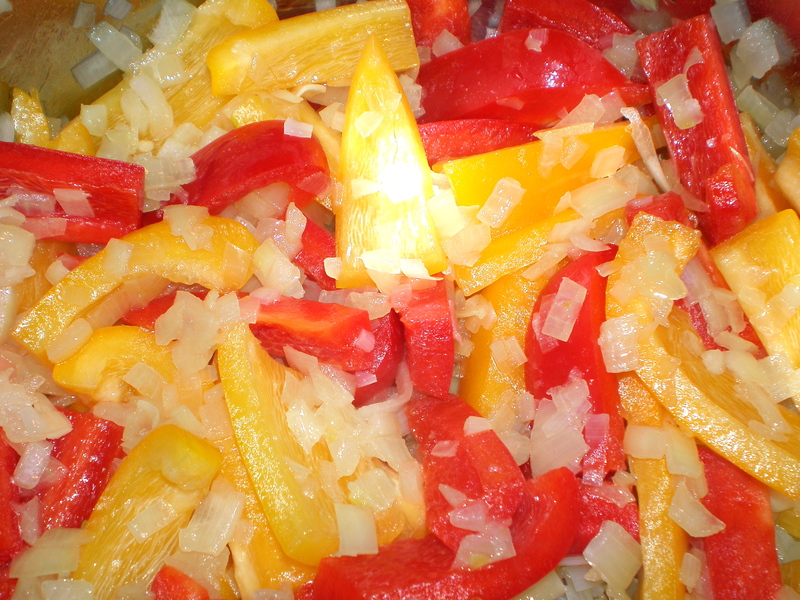 Then, add the pepper strips to the onions and allow these to cook for 5 minutes, mixing occasionally. After 5 minutes, turn the heat to a low simmer and add the garlic. Cook for a minute or two longer. Step 8. Add the rice and chicken stock. Stir. Step 9. Add the seasoning: salt, black pepper, and crushed red pepper flakes. Mix. 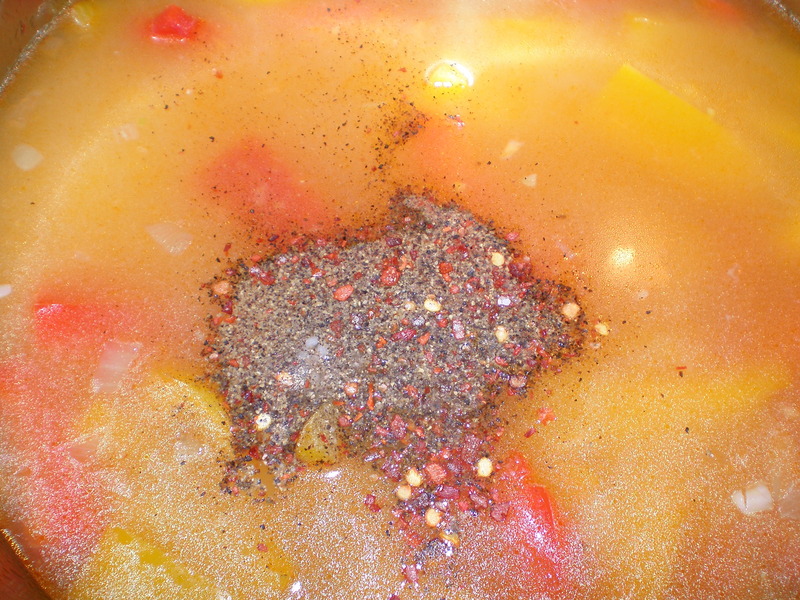 The recipe only calls for 1/4 teaspoon of red pepper flakes, but this small tsp. packs a punch! Unless you like your food on the spicy side, I would decrease the amount. I happen to love spicy food so it didn’t matter so much to me – the spicier the better! Step 10. Add the saffron. 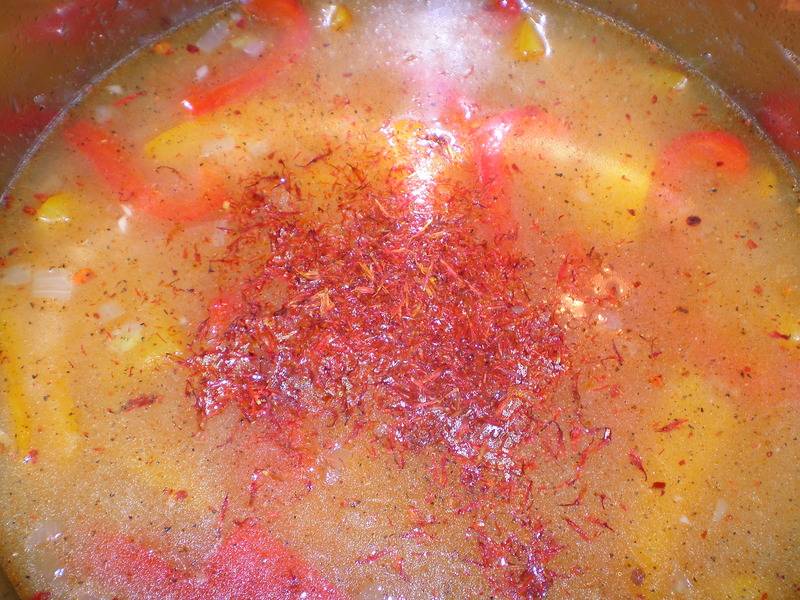 If you’ve never used saffron before, they are dried flowers used as natural food coloring. This is what gives paella its vibrant yellow color. It has no taste and the color intensity depends on how much you add. The more saffron, the deeper the yellow color. I know, I know it looks red here but the end result is yellow. P.S. if you buy this at your local grocery store they will most likely overcharge you an overwhelming amount (ie $5 for an oz.). I recommend going to an Asian supermarket where bags of these are sold for cents, not dollars. Step 11. Mix everything together then bring the heat up to a boil. Once it is at a boil, lower the heat back down to a simmer and cover the pot. Set the timer for about 14 minutes and allow the rice to cook. You may need 4 minutes more or less, depending on your stove. *Ina’s recipe suggests cooking it in the oven, but I found this method to take soo much longer. I think cooking it on the stove top is just fine. Step 12. While the rice is cooking, do these next steps. In a separate non-stick frying pan, heat some olive oil on medium heat. 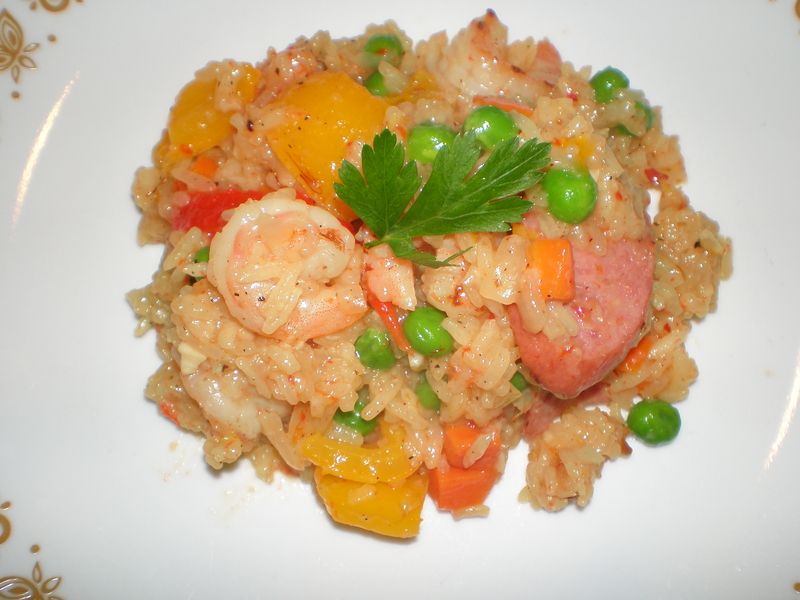 Saute the shrimp and kielbasa separately then set aside. *Ina’s recipe doesn’t include searing these two, but who doesn’t love a little bit of fried, carmelized goodness?! Additionally, my local grocer did not have lump lobster meat available *sob* and the tail meats they were selling were incredibly priced ($25 per pound, yikes!). So, I went with the next best thing, shrimp. Gotta improvise sometimes, ya know? Step 13. Give the parsley a rough chop and slice the lemon into wedges. Step 14. When the rice is finished cooking, turn the heat off and move the pot to a different burner. 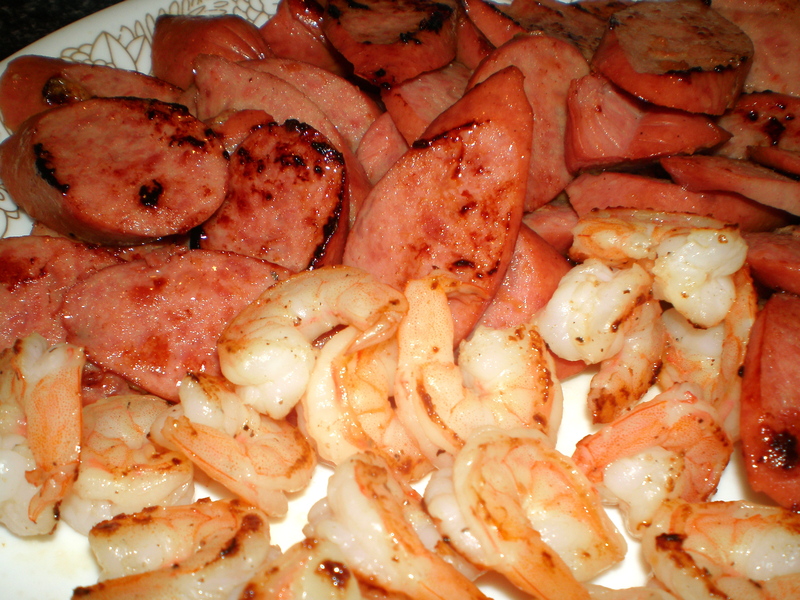 Add the kielbasa and the shrimp. Mix evenly. Do not worry if there is rice sticking to the bottom of your pot. Don’t try to scrape it off now, you’ll just end up frustrated at your unsuccessful attempts. Mix the layers on top that aren’t sticking instead. You do this for two reasons: one, it creates a layer which protects further rice from sticking to the bottom of the pot and two, you will find that once this dish cools off, the bottom layer will scrape off easily with the aid of a spatula. 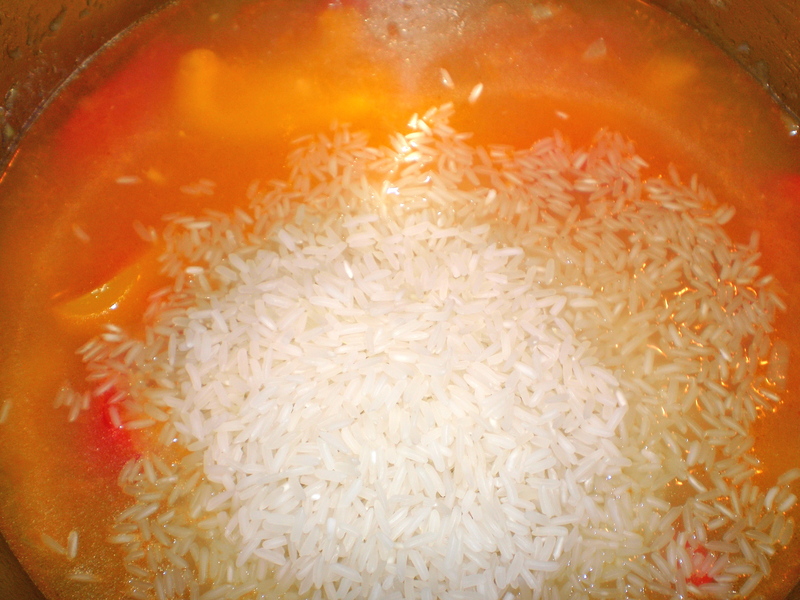 The steam that gathers in between the rice and the bottom of the pot creates a moisture that will eventually release the rice from its sticky hold. If you burn the rice however, that’s a different story. Keep the heat on low and your rice will turn out perfect. *You also add the 1/3 cup of pernod here, which I think is optional. Step 15. Add the veggies and mix until everything is evenly combined. Taste, and add salt if necessary. Step 16. 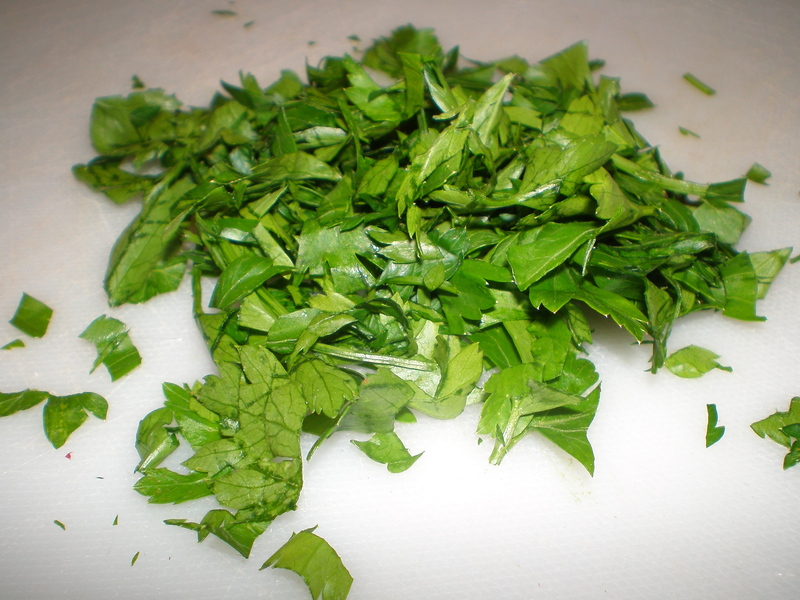 Garnish with a bit of parsley and lemon wedge. I like a little squeeze of lemon over my paella. The first time I tried paella, it was a quiet Sunday afternoon. It was about 3pm. The house was quiet. No one was home and I didn’t care. I had just came home from a long, crazed-filled weekend in Cadiz where they were celebrating Carnaval. The walk home from our drop-off point was merely blocks away from our apartment but my feet felt like they couldn’t carry me two steps further. What a sight I must have been, walking down Calle Recogidas, bright green afro wig still on, mask and duffel bag in tow. I wanted to face plant into my bed and sleep until next month. On the way back to my room after a long hot shower, I saw a note on our dining table next to a bowl of paella. No words, only a smile. I didn’t even know it yet but Antonita* totally knew just what I needed to end the day right. And it was to die for. And I’ve never tasted anything like it since. I don’t know if it was the sheer exhaustion that made it taste perfect or perhaps it WAS perfect. I don’t care much for an explanation. But this is definitely one of those things that bring a rush of memories time and again. I know you have your food mementos too and I hope you never forget them. *Antonita – quite possibly, the best host mother I’ve ever had, abroad. I was just about to say! I MUST try your shrimp & chorizo soon! Food would too bland without some hot sawwss! 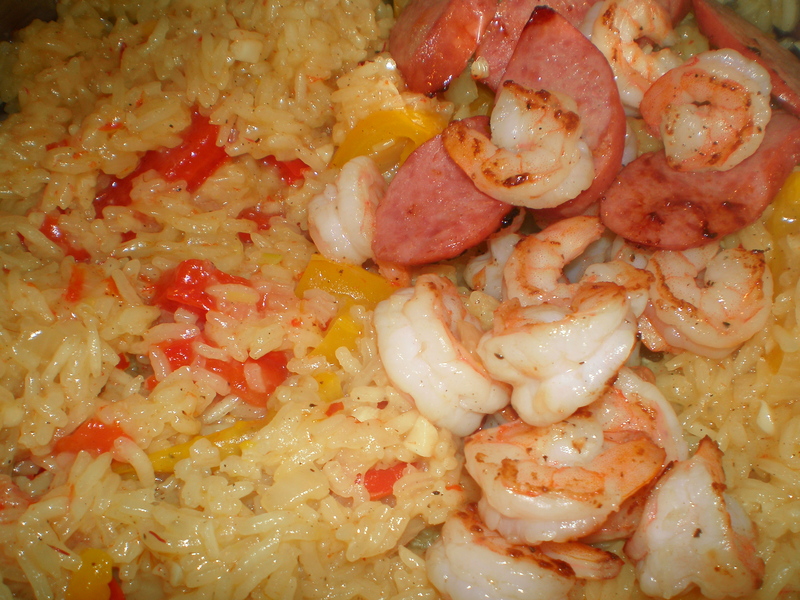 That paella looks yum! I’ve made some before, but this looks like a winner! Random, but isn’t saffron expensive? Gah, I bought some at TJ’s and it was like 6 something. And it was in a tiny bottle. Geez. Haha. Anyway, thanks for sharing! Thank you, your blog is among my faves to read as well!! I knoooow what you’re saying about the saffron being expensive- that’s why I don’t get it anywhere else except the Asian grocery stores. No joke, I buy a plastic baggie for less than a dollar. Check out Four Seasons, I believe they should have it for cheap-o ! Mmmm paella. Yours has a lot more veggies than what I’m used to, but I’m sure it was delicious. I like the new layout! Definitely. 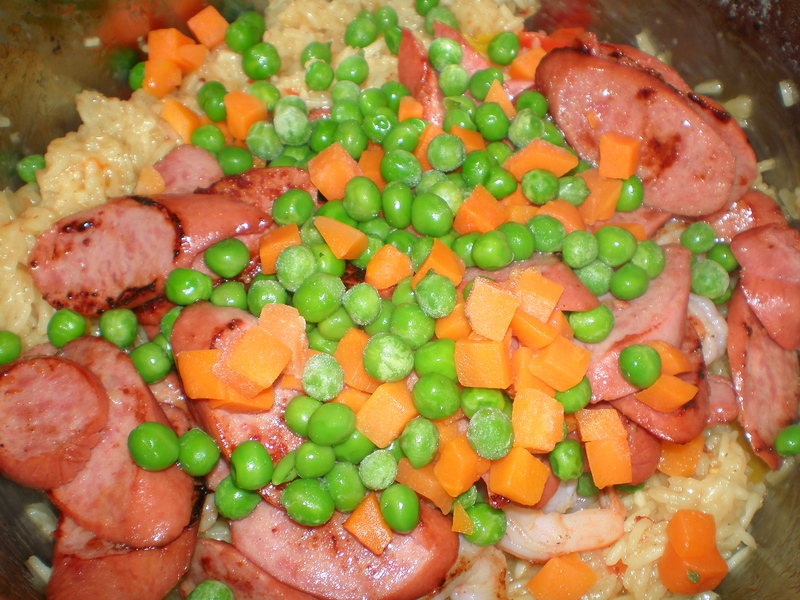 If this was Paella a la Karen, I’d know better than to add a heaping pile of peas and carrots =p aaaand it would prolly come with an extra touch of hot sauce heheh.